Dear TNPSC aspirants, another quality product from Mc Graw Hill Publication for TNPSC Exams preparation is released. Yes, TNPSC General Studies Manual is now available in Tamil Language also. On behalf of all visitors, www.tnpscportal.in wishes Author of 'TNPSC தேர்வுகளுக்கான பொது அறிவு கையேடு (குரூப் I, II, IIA, IV, VAO)' Mr.M. 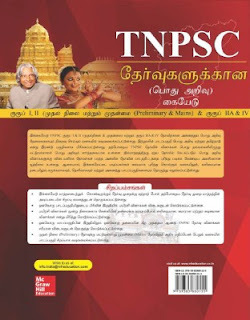 Karthikeyan and the Mc Graw Hill Publication for this wonderful resource for TNPSC preparation. www.tnpscportal.in Review : TNPSC தேர்வுகளுக்கான பொது அறிவு கையேடு has the same chapters as Manual for TNPSC Examinations (English). The contents are also written in simple language . The author has tried his best to provide this as a comprehensive manual for TNPSC General Studies Paper. As a special feature, practice questions are given in three level (easy, difficult, more difficult).Previous year questions are given subject wise at every chapter end. Hope this will really serve as a primary source of study for lakhs of TNPSC aspirants who prepare the examinations in Mother Language. There was a strong demand among all TNPSC Aspirants for a One-stop text that will cover full syllabus of TNPSC Exams. Mc Graw Hill Education Publication, one of the worlds best publications has come up with a Comprehensive text book for TNPSC General Studies . It is the first regional product from the MC Graw Hill publications in India. Tamilnadu job aspirants are really gifted with this TNPSC General Studies Mannual. Consider, 'studying for TNPSC exam' as cutting a tree and 'proper study materials' as 'tool (axe) used for cutting the tree' . Imagine, how will you feel, if some body gives you an already perfectly sharpen axe to cut the tree . Yes, here is the 'sharpen axe' for your TNPSC preparation in the form of a comprehensive Manual for TNPSC Examinations. Here after, you need not spend most of your preparation time in searching and collecting study materials. Mc Graw Hill has come up with a very good comprehensive study materials for TNPSC aspirants. 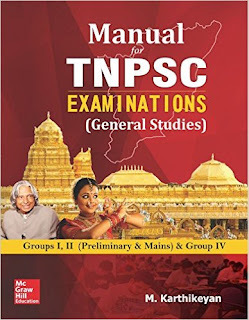 Authored by M.Karthikeyan, Director of Manithanaeyam, one of the best TNPSC / IAS coaching institutes in Tamilnadu, the TNPSC General Studies Manual is subject wise well organised. The book has comprehensively covered every portions of the TNPSC General Studies Syllabus. I personally suggests all TNPSCPortal visitors to have a copy of this valuable resource. Written in Simple English - Even Tamil Medium candidates also easily understand. Every chapter has a set of practice test at the end. Previous Year questions are given in each topic, arranged year wise with answers. The book has very good coverage for Group 1 and Group 2 Mains Examinations. The book is available in all book shops and online also.